The Codex on Flight (preserved in the Royal Library of Turin) represents the most advanced and organic state of Leonardo’s studies on flight. At first glance, there do not appear to be any complete drawings of flying machines in it, but In his notes, Leonardo describes its dimensions, the materials with which it is to be built, its shape and how it works: the whole notebook revolves precisely around the construction and use of the machine. Leonardo also imparts some “flying lessons” on how the pilot should operate the machine. The drawings of the machine have always been there, they just needed to be interpreted and placed in relation to one another: they are found on folios 5r, 12v, 16r, 17r and, most importantly, 17v. The drawing of the pilot inside the cockpit of the machine is on folio 5r, along with instructions as to how he should arrange himself: he must be free from the waist upwards in order to be able to move and counterbalance the force of the wind. There is no complete view of the whole machine. However, by gathering the different details together, we can reconstruct what must have been the complete design. The piloting must have been complex. The pilot would use his hands and feet to activate ropes and could rotate, move and open and close the wings with his own movements. Leonardo’s design is not drawn in its entirety. We must therefore reconstruct the indispensable parts. 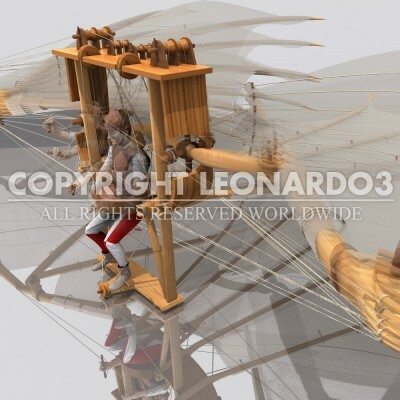 These include: the canvas to cover the wings, some articulations and pulleys, and the tail, which Leonardo knew was indispensable for controlling the machine. 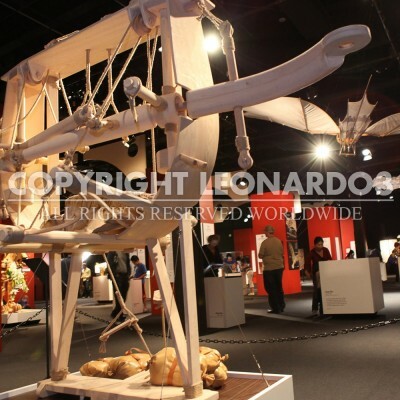 Leonardo hypothesized a case in which the wing span of the machine measured 30 arm’s lengths or about 52.5 feet.